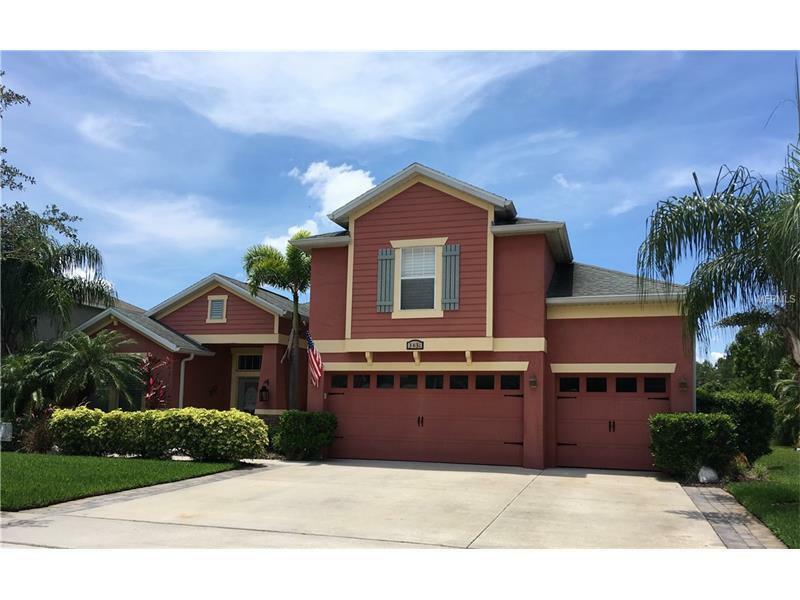 Impressive home with 4 bedrooms and 3 full baths. From the lushly landscaped front yard, pass the stucco and stonework column to enter, with double doors to the formal living room on the left, and formal dining room on your right. Ahead is the large family room and with a view of the lanai and pool and pond beyond. The family room opens to the breakfast bar in the kitchen. The fully equipped kitchen features stainless appliances, a prep island, 42" cafe au lait cabinetry, tile backsplash, closet pantry, and built-in desk. There is a breakfast nook with view to the pool. The master suite features a large bedroom with tray ceiling, plantation shutters, and a private bath with huge walk-in closet, separate sink vanities, garden tub, and step-in glass and tile shower for two. BR2 has its own full bath, and BR3 and 4 share the third full bath. Upstairs is a spacious 17"x21" loft/media/game room with surround-sound & walk-in closet. You can access the pool area by the hall or family room French doors. The lanai and pool deck have paver brick flooring. There is a permanent Tiki Hut with electric and fan for shaded get-togethers any time of year. The freeform pool has a fountain with multicolor fiber-optic lighting, and PebbleTech finish. There is a 3-car garage with shelving and storage options. Insulation has been upgraded, even in the walls. Imagine unwinding from your stressful day sitting by the pool, with bubbling fountain and sparkling lights! It's totally possible! Note: CDD fee is included with taxes.